Chinguetti (Berber languages: Cengiṭ, Arabic: شنقيط‎, translit. Šenqīṭ) is a ksar or a Berber medieval trading center in northern Mauritania, located on the Adrar Plateau east of Atar. Founded in the 13th century as the center of several trans-Saharan trade routes, this small city continues to attract a handful of visitors who admire its spare architecture, scenery and ancient libraries. The city is seriously threatened by the encroaching desert; high sand dunes mark the western boundary and several houses have been abandoned to the sand. Notable buildings in the town include The Friday Mosque of Chinguetti, an ancient structure of dry-stone construction, featuring a square minaret capped with five ostrich egg finials; the former French Foreign Legion fortress; and a tall watertower. The old quarter of the Chinguetti has five important manuscript libraries of scientific and Qur'anic texts, with many dating from the later Middle Ages. In recent years, the Mauritanian government, the U.S. Peace Corps, and various NGOs have attempted to position the city as a center for adventurous tourists. Visitors may "ski" down its sand dunes, visit the libraries, and appreciate the stark beauty of the Sahara. Occupied for thousands of years, the Chinguetti region was once a broad savannah. Cave paintings in the nearby Amoghar Pass feature images of giraffes, cows and people in a green landscape. It is quite different from the sand dunes of the desert found in the region today. The city was founded in 777, and by the 11th century had become a trading center for a confederation of Berber tribes known as the Iẓnagen Confederation. It was at the crossroads of trade routes. Soon after settling Chinguetti, the Sanhadja first interacted with and eventually melded with the Almoravids, who controlled an empire stretching from present-day Senegal to southern Spain (they called the latter al-Andalus). The city's stark unadorned architecture reflects the strict religious beliefs of the Almoravids, who spread the Malikite rite of Sunni Islam throughout the Western Maghreb. After two centuries of decline, the city was effectively re-founded in the 13th century as a fortified cross-Saharan caravan trading center connecting the Mediterranean with Sub-Saharan Africa. Although the walls of the original fortification disappeared centuries ago, many of the buildings in the old section of the city date from this period. For centuries the city was a principal gathering place for pilgrims of the Maghreb to gather on the way to Mecca. It became known as a holy city in its own right, especially for pilgrims unable to make the long journey to the Arab Peninsula. It also became a center of Islamic religious and scientific scholarship in West Africa. In addition to religious training, the schools of Chinguetti taught students rhetoric, law, astronomy, mathematics, and medicine. 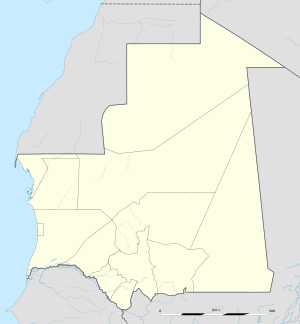 For many centuries all of Mauritania was popularly known in the Arab world as Bilad Shinqit, "the land of Chinguetti." Chinguetti is locally said to be the seventh-most holy city of Islam, but there is no recognition of this claim outside of West Africa. The city remains one of the world's most important historical sites both in terms of the history of Islam and the history of West Africa. Although largely abandoned to the desert, the city features a series of medieval manuscript libraries without peer in West Africa. The area around the Rue des Savants was once famous as a gathering place for scholars to debate the finer points of Islamic law. Today the quiet city still offers the urban and religious architecture of the Moorish empire as it existed in the Middle Ages. In 1996, UNESCO designated Chinguetti, along with the cities of Ouadane, Tichitt and Oualata, also in the dunes area, as a World Heritage Site. The Friday Mosque of Chinguetti is widely considered by Mauritanians to be the national symbol of the country. The recently discovered offshore oilfield was named Chinguetti in its honor. Ahmad ibn al-Amin al-Shinqiti (1863–1913), who was born and lived here, is one of Mauritania's most famous writers. Muhammad al-Amin al-Shinqiti (1887–1973), an Islamic scholar. The Chinguetti meteorite is a find reputed to come from a large unconfirmed “iron mountain”, located in the nearby of the town. ^ Statistiques Démographiques : Résultats du RGPH 2000 des Wilayas, La Marie de la Commune de Ain Ehel Taya, archived from the original on 9 March 2009, retrieved 7 August 2011 . Wikimedia Commons has media related to Chinguetti. "Map showing Chinguetti: Fond Typographique 1:200,000", République Islamique de Mauritanie: Chinguetti Sheet NF-28-VI https://web.archive.org/web/20131225082723/http://ml-datos.com/4/ficheros/mapas/mauritania/Chinguetti.PNG, archived from the original on 2013-12-25 Missing or empty |title= (help). This page was last edited on 8 January 2019, at 16:31 (UTC).